This class represents an entire state of memory via MemoryMap, allocating new memory in units of pages (the size of a page is configurable. Definition at line 167 of file ConcreteSemantics2.h. The addrProtoval and valProtoval must both be of ConcreteSemantics::SValue type or derived classes. Definition at line 194 of file ConcreteSemantics2.h. 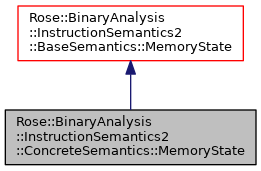 Referenced by create(), and Rose::BinaryAnalysis::InstructionSemantics2::ConcreteSemantics::RiscOperators::instance(). For efficiency purposes, the data buffers are not copied immediately but rather marked as copy-on-write. However, the newly constructed memory map will have its own segments, which hold the segment names, access permissions, etc. Definition at line 202 of file ConcreteSemantics2.h. Creates a memory state having specified prototypical value, which should be of type ConcreteSemantics::SValue or subclasses. Definition at line 213 of file ConcreteSemantics2.h. Creates a new deep copy of this memory state. For efficiency purposes, the data buffers are not copied immediately but rather marked as copy-on-write. However, the newly constructed memory map will have its own segments, which hold the segment names, access permissions, etc. Definition at line 223 of file ConcreteSemantics2.h. Recasts a base pointer to a concrete memory state. This is a checked cast that will fail if the specified pointer does not have a run-time type that is a ConcreteSemantics::MemoryState or subclass thereof. Definition at line 232 of file ConcreteSemantics2.h. Definition at line 241 of file ConcreteSemantics2.h. Definition at line 272 of file ConcreteSemantics2.h. If the specified map's areas are not in units of pages then padding segments will be added to this memory state. The padding segments will either have the accessibility specified by padAccess, or will have the same accessibility as the memory region being padded. All padding segments will be named "padding". Size of each page of memory. Memory is allocated in units of the page size and aligned on page-size boundaries. The page size cannot be changed once the map contains data. Definition at line 287 of file ConcreteSemantics2.h. Allocate a page of memory. The specified address will be contained in the page, which is aligned on a page boundary. Do not call this if the page is already allocated unless: it will replace the allocated page with a new one containing all zeros.